Have you had a volunteer mentor you in No Boundaries or WalkFIT? Have you had a volunteer pace you through a long run early Saturday morning in all conditions during our Half/Full Marathon Training? Then join us so you can thank them like we will on this special night! Save this Date! We will start with a group 3 mile run/walk then the party will begin at 7PM. 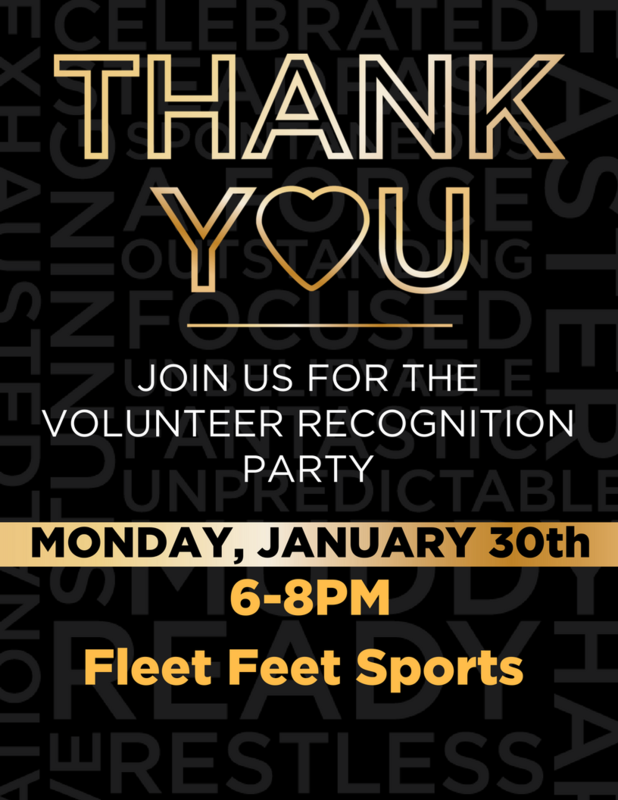 Refreshments will be served and we will be recognizing Volunteers with Distinction as well for volunteering Fleet Feet Training throughout the entire year. Come celebrate all these volunteers who helped you in 2016 meet your goals whether toward a race or at our training! They dedicated hours of their time to help you and make your day special - so join us to say Thank You!